We receive lots of inquiries as to how to test the Biomagnetic Research devices, how to determine that they are effective. Our own experience was quite clear-cut. 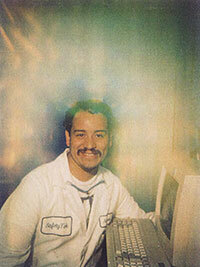 In 1986 we created our first website and spent many hours in front of the computer. We experienced the usual symptoms of computer fatigue: foggy cognition, fatigue, and visual blurring. The symptoms were striking, and we didn’t know what to do about them. 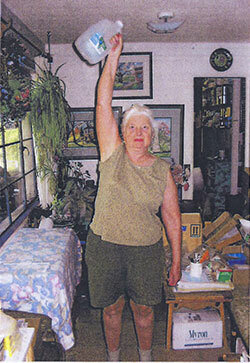 At that time, we didn’t know the devices existed, but discovered them at a dowsing convention in Vermont. The devices were intriguing, and Robert and Charmion McKusick were eloquent in their descriptions of the many ways in which our health and well-being are undermined and compromised by electromagnetic pollution. Taking a few of the devices home and affixing them to the computer and other electronic instrumentation in the office, we instantly found relief from the symptoms that had by then plaguing us for months. It was a wonderful taste-test; we’ve carried the devices ever since, and we warmly appreciate the support and guidance that Robert and Charmion McKusick and now Kathleen (McKusick) and Goef Condit have given us over the years. 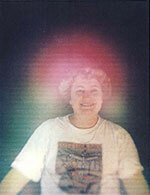 Aura photography demonstrating the effects of radiations from an active cell phone on a subject’s energy field, with the corresponding corrections when a Crystal Catalyst Cell Phone Tab has been attached to the active cell phone. These three pictures illustrate (a) the subject’s natural energy field, (b) the same subject’s energy field using an active, unprotected cell phone against her left ear, and (c) the same subject using an active cell phone protected with a cellular phone tab attached. 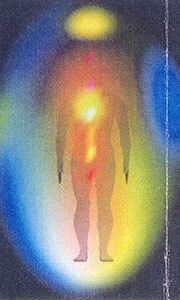 Notice how the subject’s energy field has been restored with cell phone protection! These pictures illustrate the difference in computer radiation when not using protection compared with affixing a G-33 to the computer and wearing a bead. Note the radiations and poor contrast in the picture without protection. Note the absence of radiation energy and improved photo contrast with protection. 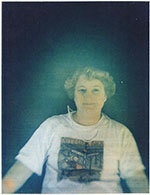 These photos were taken by Gentry High Energy Products, using Aura Camera 3000 to show the effects of one energy field on another by photography. The pictures are copyright material of Biomagnetic Research, Inc. 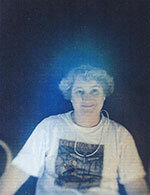 In the first picture, taken with a Kirlian energy field camera, the technician is not wearing a Crystal Catalyst Bead, and the computer monitor is unprotected. Note the streaks of radiation and energy blotches. In the second picture with resonators in place, the technicial is wearing a Crystal Caralyst Bead and a 3-Hole Resonator is placed on the computer monitor. Note the absence of radiation from the computer monitor and around the chest of the technician. 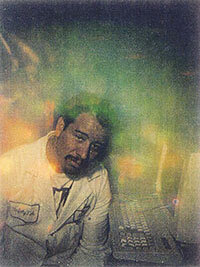 Also note imporovement of photo clarity and clarity of the technician’s etheric energy field. Note the silly grin on his face. These photographs are copyright material of Biomagnetic Research, Inc. 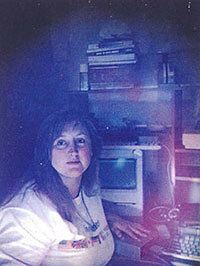 In the first picture, the subject is not wearing a Crystal Catalyst Bead. In the second picture, she is wearing a Crystal Catalyst Bead. 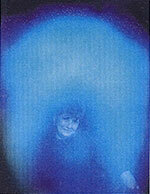 Note the clearing and brightening of her energy field. 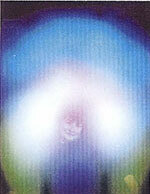 In the third picture, she is wearing a physical chakra balancer, which appears to create a field that extends at least over her upper body. In the fourth picture, the subject is wearing an Emotional Chakra Balancer. 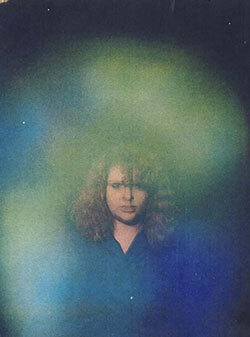 Note the colorful clarity of her aura. 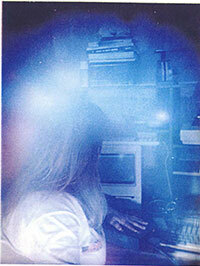 These pictures were taken by a Kirlian Camera by High Energy Products in CA. These pictures are copyright material of Biomagnetic Research, Inc. 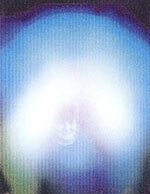 These pictures illustrate the changes in the subject’s auric field when not wearing the Crystal Catalyst Bead and when wearing it. Note the greater clarity of the picture of the subject when wearing the bead, and the greater presence of calming colors. 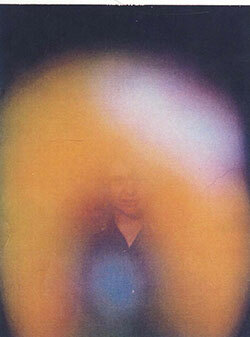 When not wearing the bead, the subject’s auric field is muddy and looks a bit irritable in the preponderance of red. 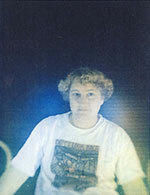 These pictures were taken at an Aura Video Station in Anaheim, Ca and are the copyright material of Biomagnetic Research, Inc. In the first picture, the subject is not wearing a pendant. The predominance of orange suggests mental energy, self esteem. 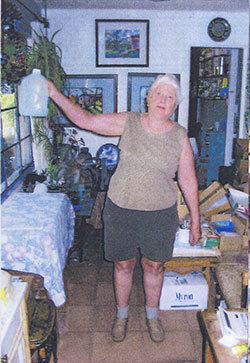 In the second picture, the subject is wearing a Breathe Easy Pendant. 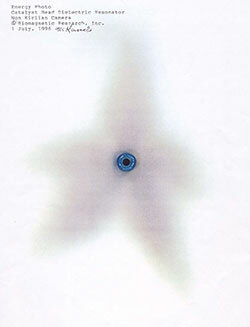 Blue suggests calmness, inner peace, honor, self esteem. Green subbests master color of spectrum, balance, abundance, prosperity, healing. This is simply a neat picture. We feel that it demonstrates a vital, protective field. These photos were taken by an independent laboratory in Sorrento, B.C., Canada and are the copyright material of Biomagnetic Research, Inc.
“In 1937, Dr. Fr. Peyre of Bagnoles do Orne, France, reported at an International Congress on radio-biology in Paris that radiations seem to exist emanating perpendicularly from the surface of the Earth. Their locations can be found by dowsing methods. These emanations seem to form zones in a checkerboard fashion, are magnetically oriented North-South and East-West, thus indicating a magnetic rather than a geographic orientation. Pevre found that these zones forming squares are recurring every four to eight meters in both directions. He also observed that these zones of radiations and especially their intersections are harmful to man and beast when they are exposed to them over an extended time. In 1951 and 1952 Hiller, a dowser, and S. Wittmann, an engineer, both of Germany, discussed a grid system they called “Polare Feldeer” (polarized fields) and ascribed to them geopathogenic effects of man. M. Curry and Wittmann worked on the correlation of these polarized fields with the appearance of illnesses. Curry believed that this grid system correlated wellwith the incidence of illness, especially cancer, provided that the patients were exposed to the grid influences over a long period. Why is brain fog such a problem with extended computer or cell phone use? Well, the brain is an electrical system and quite sensitive to electronic influence. 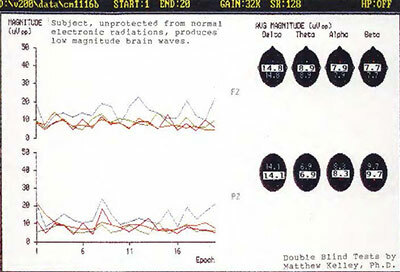 These graphs, obtained in double-blind testing by Matthew Kelley, Ph.D., illustrate the effects on brain wave frequency when the subject is unprotected compared with the subject protected by Biomagnetic Research devices. 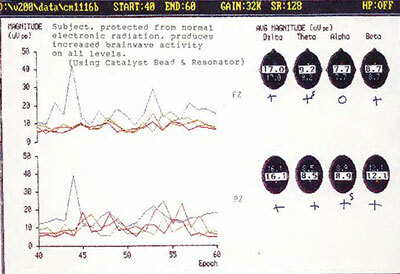 In the first picture, where the subject is unprotected from normal electronic radiations, the brain waves have a lower amplitude than they do when the subject is protected by a Crystal Catalyst Bead and a Resonator, illustrated in the second graph. These pictures are copyright material of Biomagnetic Research Inc.
We encourage you to test the Crystal Catalyst resonators yourself, using the same method that Charmion McKusick used (described above) when testing effects of the Clear Field Plate. Your body is a sensitive instrument and muscle testing is a reliable method of assessment! Doctors at the University of California at Santa Cruz used this method, called Applied Kineseology (see: http://en.wikipedia.org/wiki/Applied_kinesiology). to measure the strength changes with and without Crystal Catalyst protection. They measured strength of subjects prior to electromagnetic exposure and again, during electromagnetic exposure, when wearing Crystal Catalyst resonators. Their strength actually increased to a level greater than the measurements taken prior to exposure. The Biomagnetic Research Crystal Catalyst products won’t change your EMF Meter Reading because these products alter the frequencies rather than blocking or shielding them. The harmful frequencies are altered to be harmonious, so much so that they actually strengthen your body when you wear or use them. In other words, these products not only prevent EMF pollution, they also improve well-being. Please join us on Facebook to receive special offers and discounts! As a Company . . .
We are committed to supporting health, safety and the belief that all of our lives, everywhere, need to be secure, satisfying and fulfilling. We will not disclose any personal information about you. All information and product listings on this site may or may not benefit you. Please consult your health practitioner for any health related issues. The Essence of Things is not responsible for any issues that you may experience as a result of using any products you receive from us.